Mumbai: The regulators’ measures to mitigate risks associated with capital flows into India are in the right direction, but they also need to remove certain caps and restrictions on foreign investment, a top US government official said. “We understand Indian officials are concerned that greater capital flows associated with a financial centre would add to inflationary pressures, destabilise financial markets or add to exchange rate volatility," US Treasury Secretary Henry M Paulson Jr said at the US-India CEO Forum here today. However, India was on the right path to reduce these risks, he said. The country was allowing greater flexibility in its exchange rate in recent months, the US official said, adding that the appreciation in rupee has helped reduce inflationary pressures. He added that there is a need to remove various caps and restrictions on foreign investments. Besides, limits on debt and equity financing and asset allocation restrictions on financial institutions are impediments to putting resources to their most productive use, Paulson said. “I encourage India to continue liberalising such restrictions," Paulson said, adding “steps to broaden and deepen the domestic financial sector will also mitigate the risks posed by greater flows." Paulson said the US Department of Treasury also supports steps to strengthen and expand India’s financial system by developing Mumbai into an International Financial Centre (IFC). “Today, Indian firms in Bangalore and other cities play a key role in the back-office operations of global MNCs. In this, India has revolutionised the way the world does business," the US official said. There is a need to develop front-offices in Mumbai that would provide financial services to companies and investors in India and across the region. Similarly, experiences of financial centres in other countries show that the overwhelming majority of jobs created will be for Indians, he said. It would help small businesses, shopkeepers and farmers get easy access to credit, financial services and insurance products. The economic reforms which started in 1991 have continued at varying speeds throughout the past 15 years regardless of the party in power. 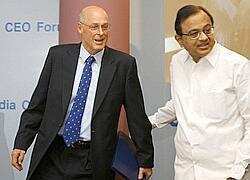 “Observers do not question whether India’s reforms will continue, they ask only about the pace" Paulson said. “We understand that India faces certain political challenges in this process — that is something our government also shares," he said. India should continue with its liberalisation process and develop a financial system to ensure that the vibrancy and growth that its economy now enjoys continues in the future as well, Paulson added.